Dividend growth investing is like a gardener who plants a seed once and then harvests its fruit several times over. About a month and a half ago, I came across a high-yield opportunity in an unlikely place. I was in Wegmans, my local grocery store. At the time, my wife and I were regularly forking over about $4 per pint for their organic, ready-to-eat grape tomatoes. But on this particular day, Wegmans was selling organic tomato plants for roughly the same amount as the ready-to-eat pints. I was like a kid in a candy store. I loaded my cart with plants, headed home, and planted them right away. Today — one and a half months later — it’s raining grape tomatoes… and our little investment is paying off. I figure each $4 plant has been growing about $1.00 worth of grape tomatoes each day for the past 10 days. So we’ve more than doubled our investment on each plant so far. In addition, all the plants are still fully intact. And judging by all the clusters of green tomatoes on the vines today, we should easily quadruple our investment by this time next week. In short, our one-time investment is showering us with yield, day after day… and for possibly weeks to come. It’s a similar opportunity with dividend growth investing, but even better. You see, our tomato plants are only going to produce fruit this year. I’ll have to buy new ones next year and start over. Not so with dividend growth investing. When you buy a high-quality dividend growth stock, the idea is to buy it once and hold it forever. And while you’re holding it, you collect payouts year-after-year. Better yet, these payouts will ideally increase year-after-year as well. This is precisely why dividend growth investing is the primary strategy I use in my brokerage accounts. I can make a one-time investment and have the potential to get paid steadily-increasing payouts for life. Without doing any extra work on my part. It’s the only strategy I know of that’s designed to pay a passive, predictable income stream that goes up over time. You should know, however, that there’s one major catch with this strategy: It requires time. You see, if you’re investing in high-quality dividend growers, your starting yield will likely be relatively low (around 2% to 3%). To collect a meaningful yield-on-cost, you need time for the dividend to grow. For younger investors, time may not be a problem. But what if you’re nearing or already in retirement and you need high income right now? With all of this in mind, let’s get to this week’s High-Yield Trade of the Week— a trade that could pay you 19.9% to 32.4% in annualized income. As an investment, CVS meets all my criteria: It’s a high-quality dividend growth stock that appears to be trading below fair value. Because of CVS’s fast-growing dividend and reasonable valuation, I think long-term investors could do well buying at today’s market price, holding for the long-term, and reinvesting dividends along the way. 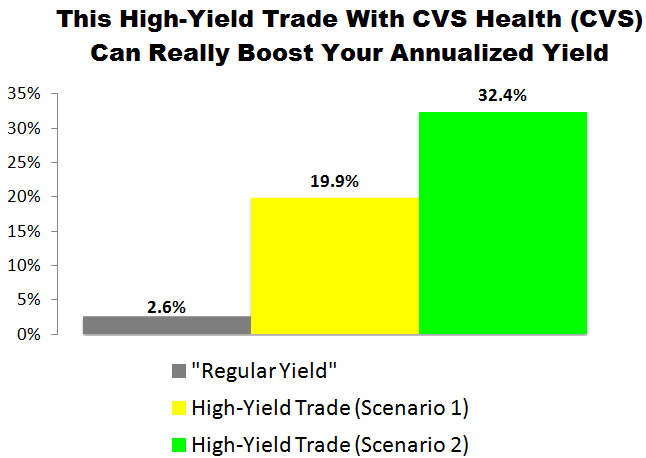 For those looking for high current income, CVS does okay with its 2.6% dividend yield. But you can do even better with our High-Yield Trade of the Week. You see, by selling a covered call on these very same shares, we can boost our income significantly — generating an annualized yield of 19.9% to 32.4%. That’s over 7x the stock’s “normal” income! As we go to press, CVS is selling for $77.08 per share and the August 25 $78.00 calls are going for about $1.47 per share. Our trade would involve buying 100 shares of CVS and simultaneously selling one of those calls. By selling a call option, we would be giving the buyer of the option the right, but not the obligation, to purchase our 100 shares at $78.00 per share (the “strike” price) anytime before August 25 (the contract “expiration” date). In exchange for that opportunity, the buyer of the option would be paying us $1.47 per share (the “premium”). If CVS stays under $78.00 by August 25 our options contract would expire and we’d get to keep our 100 shares. In the process, we’d receive $147 in premium ($1.47 x 100 shares). Excluding any commissions, if “Scenario 1″ plays out, we’d receive a 1.9% yield for selling the covered call ($1.47 / $77.08) in 35 days. That works out to a 19.9% annualized yield. If CVS climbs over $78.00 by August 25 our 100 shares will get sold (“called away”) at $78.00 per share. In “Scenario 2” — like “Scenario 1” — we’d collect an instant $147 in premium ($1.47 x 100 shares) when the trade opens. We’d also generate $92 in capital gains ($0.92 x 100) when the trade closes because we’d be buying 100 shares at $77.08 and selling them at $78.00. In this scenario, excluding any commissions, we’d be looking at a $239 profit. From a percentage standpoint, this scenario would deliver an instant 1.9% yield for selling the covered call ($1.47 / $77.08) and a 1.2% return from capital gains ($0.92/ $77.08). At the end of the day, we’d be looking at a 3.1% total return in 35 days, which works out to a 32.4% annualized yield from CVS. We’d place a “Buy-Write” options order with a Net Debit price of as close to $75.61 ($77.08 – $1.47) as we can get — the lower the better. Options contracts work in 100-share blocks, so we’d have to buy at least 100 shares of CVS Health (CVS) for this trade. For every 100 shares we’d buy, we’d “Sell to Open” one options contract using a limit order. Accounting for the $147 in premium we’d collect, that would require a minimum investment of $7,561.